Programme for Friday and Saturday is online now! It will be PINK! Our Challenge Women Onlineshop is now open! As a present or for yourself: You will find sporty accessory for your perfect challenge women look! A good preparation for the challenge women season. *Shipping only to Germany and Austria possible. The Online Reception for 2016 is open – we will be happy to see you again! 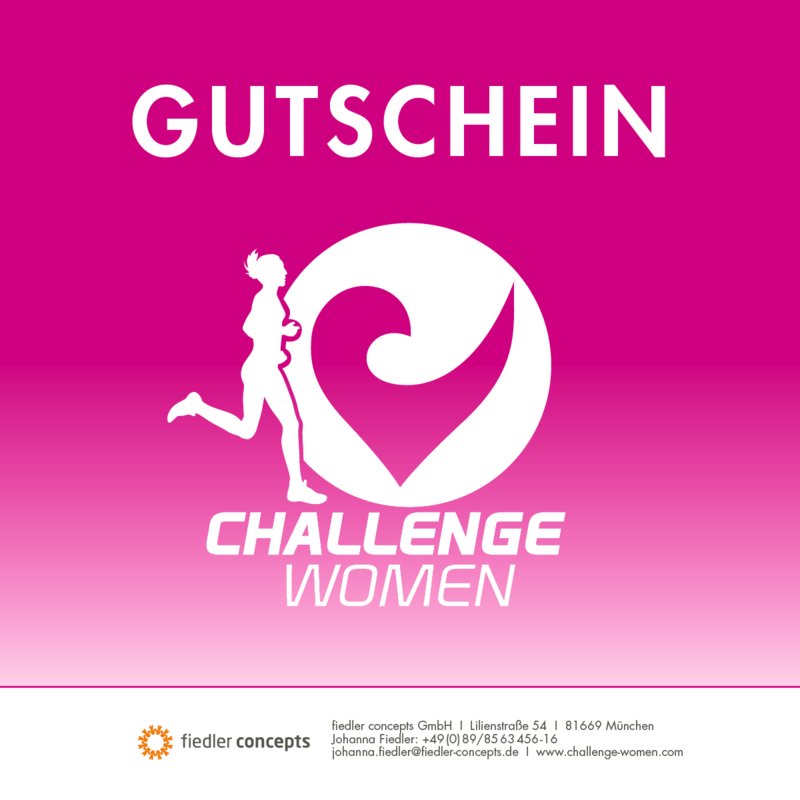 CHALLENGE WOMEN LANGEN – in spite of wind and weather, the girls are rocking the spring! On March 1 2015, the opening event of the CHALLENGE WOMEN season 2015 took place within the scope of the first Triathlon Convention Europe (TCE). Nearly 100 girls attended the 5km- run & walk. Wind and weather have done no demolition to the good mood – now the pink-coloured season is officially opened! For Billund and Roth there are of course still places – so be a part of the event and sign up today on the website! CHALLENGE WOMEN is going to be a three event series in 2015! We just can't seem to get enough of CHALLENGE WOMEN so we've decided to organize three events next year. 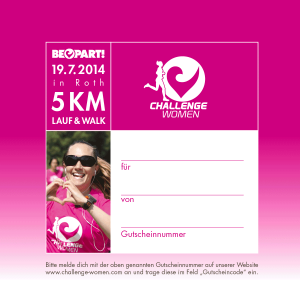 On Sunday, March 1 we're going to get the girls on their feet with a 5K run in the Rhein-Main area of Germany. The race will start at 11am as part of the first Triathlon Convention Europe (TCE). Then at 6pm on Friday, June 12 we'll head off to the world-famous LEGOLAND amusement park in the small town of Billund in Denmark; a perfect reason for Northerners and travel fans alike to to plan a weekend trip with friends and family. The European Triathlon Convention will take place for the first time in the German city of Langen from Friday, February 27 til Sunday, March 1 in the new city hall. Several brands from the industry will present their product ranges that you'll be able to test or buy. 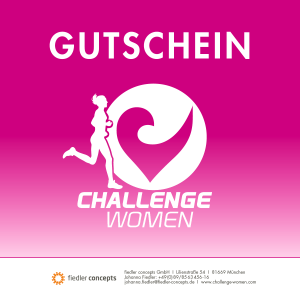 Your Challenge Women registration fee of 25€ includes a day pass (8€ value) for Sunday. So don't miss out – register today! We'll be throwing in a tech shirt, an attractive goodie bag and most importantly, a fantastic atmosphere on and off the course! with the new registration for 2015! But all the Material has to be gone through an only the best pictures should find their way to our webpage! and CEP testimonial Michelle Vesterby will guide us the way at the CHALLENGE WOMEN 2014! Even though she is starting at the long distance race on Sunday she will lead all CHALLENGE WOMEN along the track on the guiding bike – thank you so much Michelle for your commitment! Ladies, we get special male support! 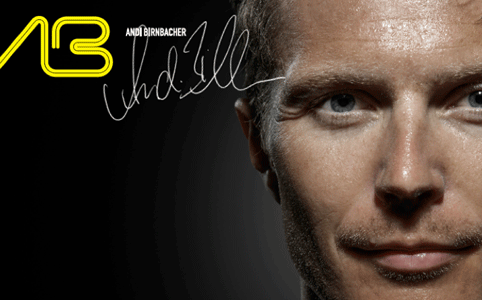 The successful german biathlete Andi Birnbacher is not only several time world series champion and world vice champion, but also an extraordinary athlete which shows with his engagement at CHALLENGE WOMEN, that endurance sport, fun and happiness not only makes women's but also men hearts leap for joy. Here at on side the free parking possibilities. The first Challenge Women Active Day was a great success! We had a fabulous day full of action and fun thanks to our host Sparkasse Mittelfranken-Süd and our supporter New Balance Germany! 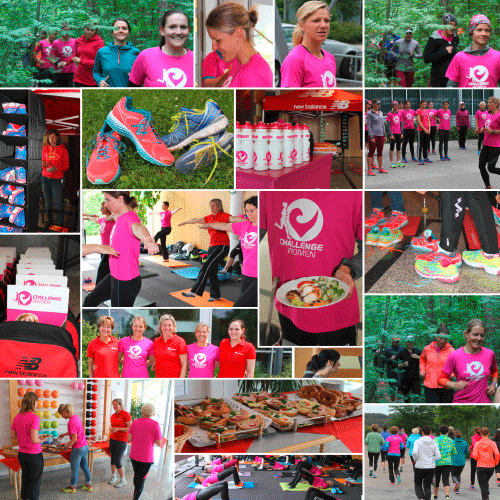 25 Challenge Women spent the day with Anja Beranek and Dani Sämmler - our two professional athletes who revealed their best tips and tricks about running. Here the nicest impressions..
Only a couple of weeks to go until Challenge Women! You can purchase gift vouchers for your best friend, sister, mother, daughter or just anyone you want to give the Challenge Women virus to! 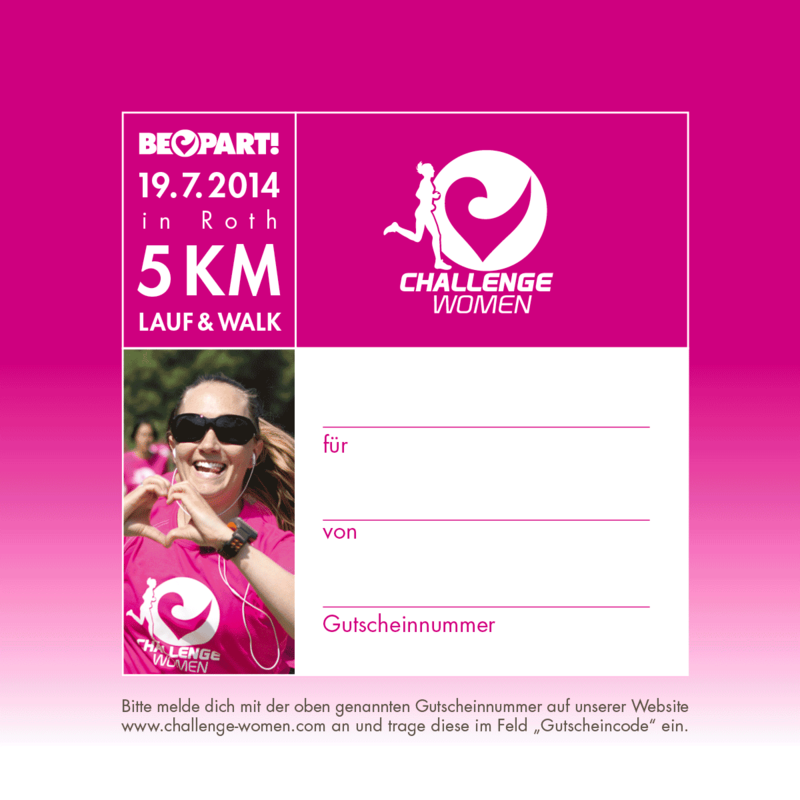 To purchase a gift voucher please contact us under info@challenge-women.com! 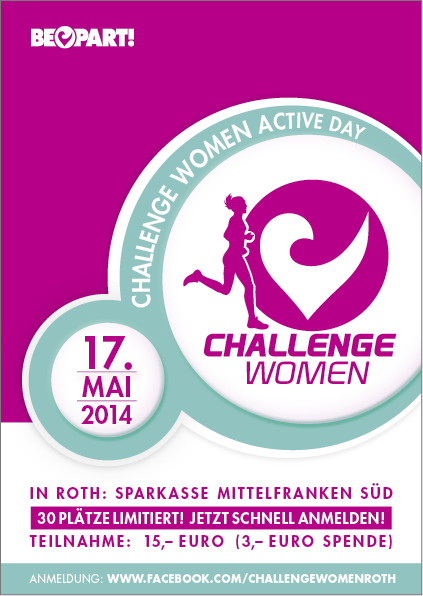 the first Challenge Women Acitve Day on 17th May to get ready for the Challenge Women. 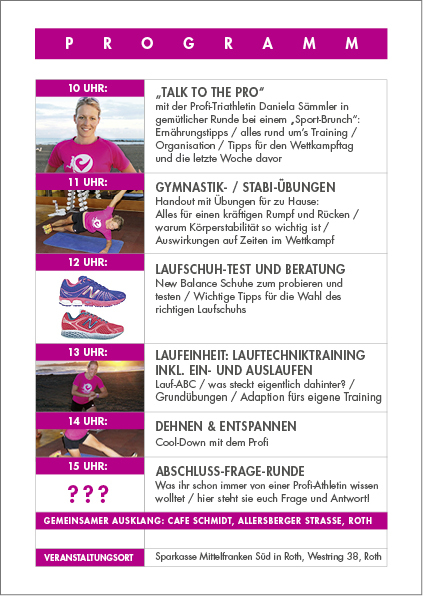 We will welcome all 30 participants at the Sparkasse Mittelfranken Süd to a day with the professional athletes Danni Sämmler and Anja Beranek to spend a day about running, training and nutrition together. is the fastest growing global long distance triathlon series, now with 26 long distance triathlons in 15 countries and we are changing the face of long distance racing around the world. Featuring spectacular courses in iconic destinations, Challenge Family events focus on delivering the race of a lifetime to athletes of all ages and abilities, and creating a memorable spectator experience that captures all the excitement and emotion of this inspirational sport. We are proud to be a pink part! DATEV Challenge Roth, the world 's largest long-distance triathlon, was this weekend honoured at the Oscars del Triathlon in Milan and judged the “World’s Best Triathlon". Under the patronage of the Italian Triathlon Federation (FITri) and the Lombardy region, the gala evening highlighted the importance of triathlon in Italy. The awards were judged by a high-level jury, consisting of FITri officials, journalists and triathletes. The "Oscars del Triathlon" were awarded in 11 categories. The Oscar for the best triathlon in the world was accepted by a delighted Kathrin Walchshöfer of DATEV Challenge Roth.